PROMOTING GROWTH WITHIN THE COMMUNITY. At Hayden Homes, we believe that building strong and thriving communities is accomplished through public and private partnerships. By focusing on the people first mentality, we work diligently to forge relationships that foster growth within our communities. Each city we build in throughout the Northwest has a unique personality and the individuals that have chosen to raise their kids and make that community their home have specific ideals about how to make their individual community thrive. Hayden Homes embraces this unique approach, that’s why we work with local suppliers and trade partners whenever possible. By keeping our money local to each city, those businesses will then be able to hire, spend and reinvest in the community themselves, creating a cycle of virtuous investment. In return, our partners and suppliers work with us to contribute their time, materials and expertise to First Story, helping us build homes for deserving families in your community. Since First Story’s inception our partners have donated nearly $1 million in time and materials to help build First Story homes. In addition, as a homebuilder we pay hundreds of thousands of dollars each year for permits and city fees, totaling $2 million to date. These fees are then reinvested by local governments to build new parks, make crucial infrastructure improvements and help pay for critical services like police, fire stations and first respondent needs. We are excited to sponsor an arts scholarship contest for Sisters High School juniors and seniors. 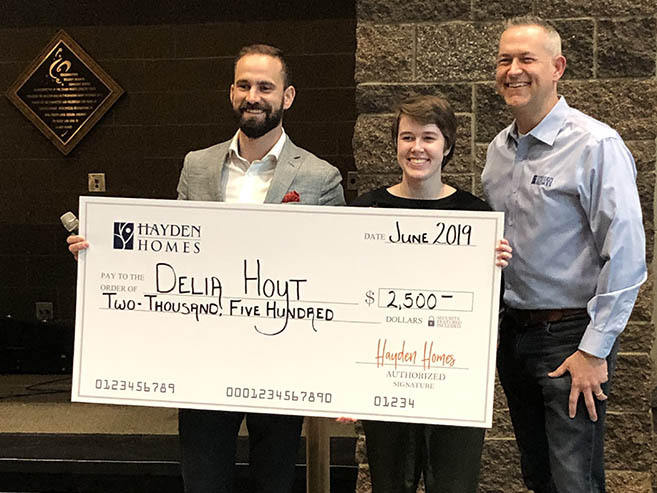 The winner earned a $2,500 scholarship from Hayden Homes which will be awarded upon graduation. To participate, students designed a 2D sketch of an all-original art work. The Sisters Arts Association judged the designs and selected a winning concept. The winning art will be displayed in our Village at Cold Springs model home beginning in summer 2019. 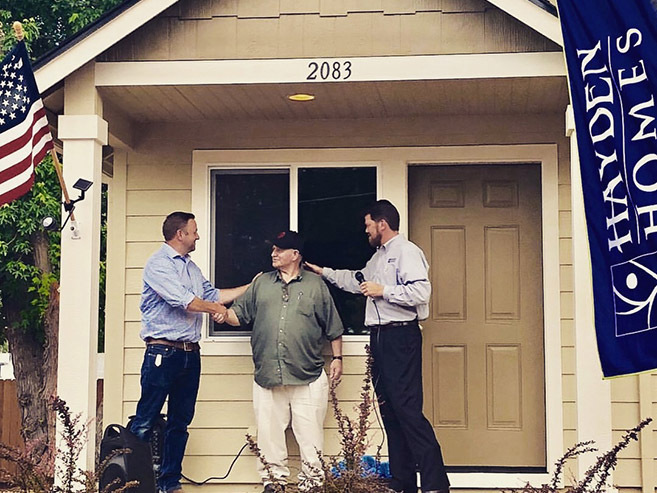 Hayden Homes, First Story, the City of Medford, OR., and numerous other partners recently came together to rebuild the 42-year-old home of William Verschoor, a veteran who fought in the Vietnam War. Verschoor voluntarily enlisted in the Army and was stationed at Dong Ha from 1968 to 1970 as a field soldier and tank mechanic. It was a true honor to be able to help Mr. Verschoor in such an impactful way. Read the full story here. Thanks to the generosity of our employees, our Summit Crest new home community homeowners, our Redmond, Oregon Real Estate Partners, and the Lending Community we were able to donate over 100 gifts to homeless Veterans Central Oregon. Thank you to the Veterans Association for allowing us to partner with them to bring cheer to Veterans this holiday season! This year, we were blown away by the generosity of our Team Members and neighbors. 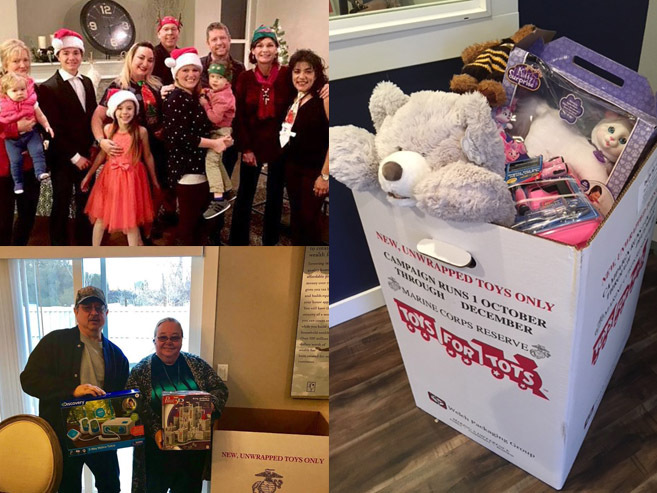 As an official drop location for new-unwrapped toys, we had box after box overflowing with toys that we were able to give to local Toys for Tots organizations. The toys are given to local children in need to allow them to enjoy a little Christmas! Thank You to EVERYONE who made it possible to give in such a wonderful way. Learn more about Toys for Tots by visiting their website here. Boys and Girls Club of BFC and More! Our South Washington Team had a blast on their recent giving spree, where they got to give to 7 organizations within the Tri-Cities! The organizations that received donations included: Boys and Girls Club BFC, Safe Harbor Crisis Nursery, Domestic Violence Shelter, YMCA – Richland, Goodwill – Employment Services, and Knights of Columbus – KC Help! The donations ranged from $1,500 – $2,000 and were gifted through the First Story Giving Fund. This year, we were a sponsor of the KNDU’s Hometown Harvest Food Drive. Four of our model homes (Westwood Estates, Clearwater Creek, Sandifur Place, and Homestead) were all drop off locations for Northwest Harvest. From the food donations alone, we gathered 2,400 lbs. of canned goods. In addition to the donations, a $5,000 check was donated to Northwest Harvest! 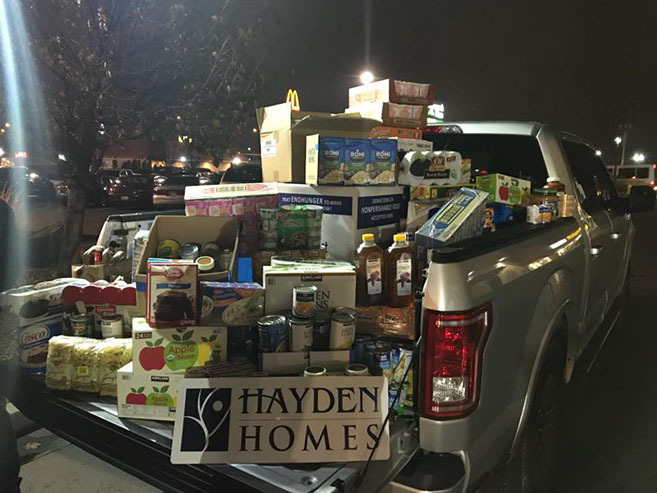 Between the check presentation and donation of food, Hayden Homes supplied 30,000 meals to those in need within our Yakima and Tri-Cities communities! Watch the NBC video of the giving opportunity here! What an incredible way to give! 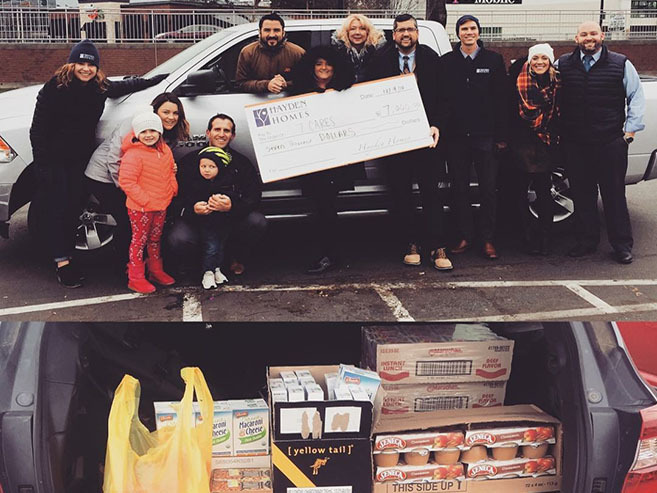 Our team recently had the opportunity to bundle up, fill the truck bed from our food drive & present a check for $7,000 to the Idaho Community Foundation! We are thankful for the generous donations & thankful to KTVB and all of the wonderful volunteers at 7 Cares Idaho Shares! We appreciate the good you are doing for our community and the State of Idaho! 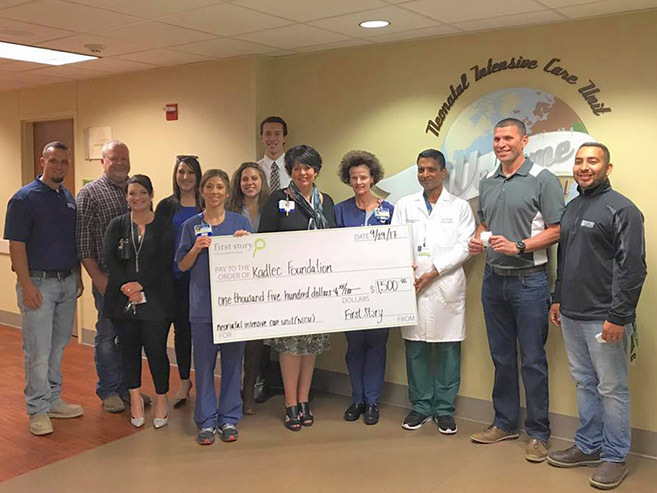 In honor of NICU Awareness Month, our Hayden Homes team was beyond grateful to deliver a $1,500 check from First Story to the Kadlec Foundation. These dollars will go towards new equipment, toys and other needs to help the 20+ infants in their Neonatal Intensive Care Unit (NICU). Thank you to the wonderful nurses, doctors and team at Kadlec for all you do for our community. There are many ways to give. Recently, Hayden Homes had the honor to be one of the sponsors of the upcoming Bend Science Center located on the Oregon State Campus in Bend. 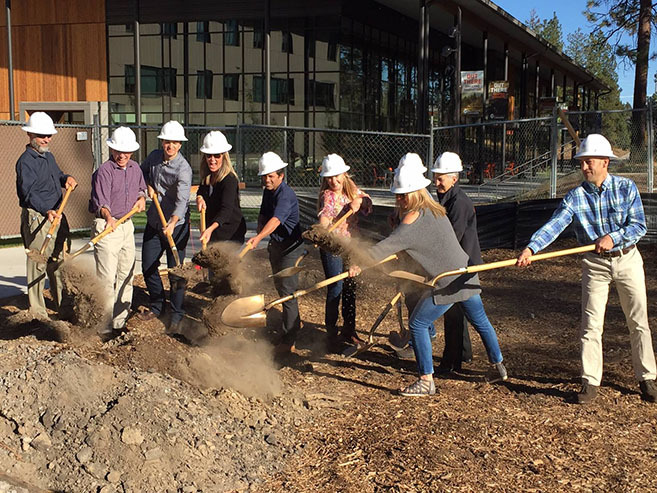 Thanks to all who made this ground breaking so memorable to community leaders and future students of the Bend Science Center! 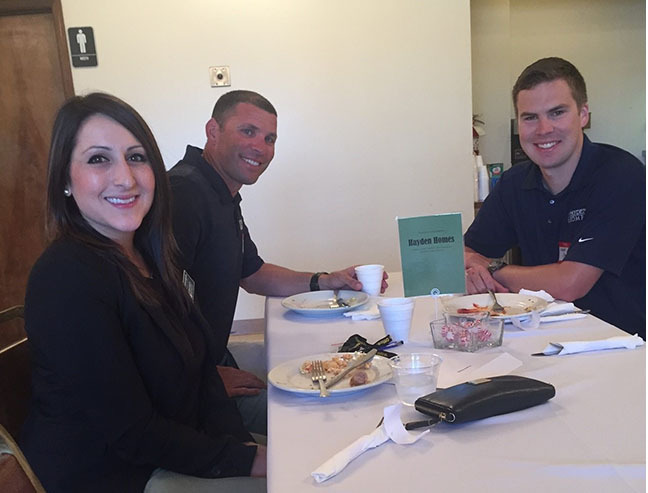 Hayden Homes was thrilled to participate and donate to the FIRST Annual “Breakfast with the Sheriff” event in June. Adopting the idea from the Kennewick Police Department, The Franklin County Sheriff’s Department was excited to implement a new Community Care Fund, which enables the department to immediately help Franklin County community residents, when in need. 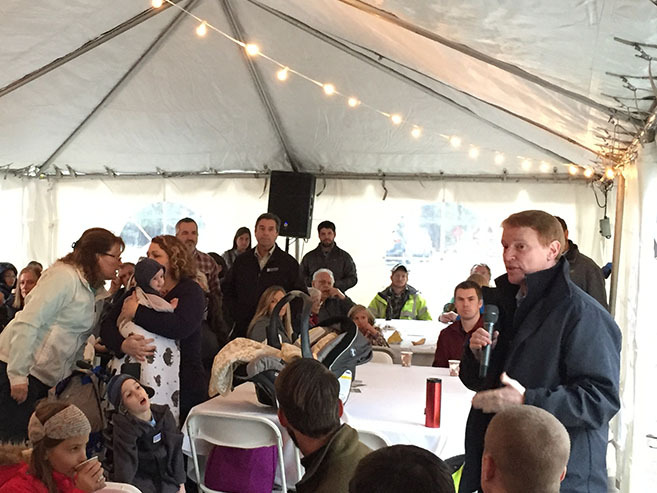 The breakfast event had over 100 community members in attendance and raised over $8,000 for their fund. It was and honor to be able to give to this organization that is dedicated to giving to the communities in which we build and helping those in need. 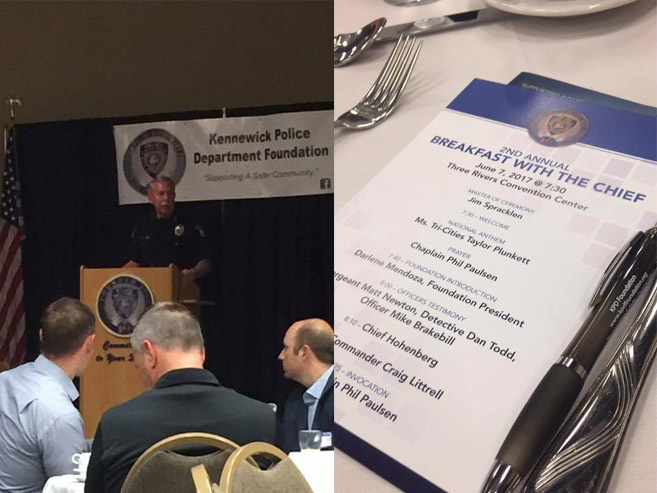 The South Washington team had a remarkable time at the Kennewick Police Foundation “Breakfast with the Chief” event in Kennewick. Hayden Homes is a proud supporter of the Kennewick Police Department and their Community Care Fund. The Community Care Fund was started in March 2015, and since then has helped over 200 people and families. Their mission is to support a safer community by consistently identifying and securing public and private contributions which are used to supplement funding for selected education, training, special equipment and legitimate programs for the Kennewick Police Department and Community. We were honored to provide a $1,500 sponsorship to this wonderful organization, who are bettering our communities every day. 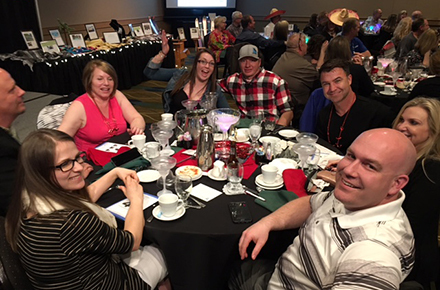 The Inland NW team had a great time at the annual Tesh Inc. dinner auction fundraiser in Coeur d’ Alene. Hayden Homes is a proud supporter of Tesh. Tesh’s mission is to offer choices and opportunities to people of all ages with disabilities or other challenges seeking greater independence, self-sufficiency, and participation in the community. We are honored that we are able to give in such a away to an amazing organization that is helping to better our communities. 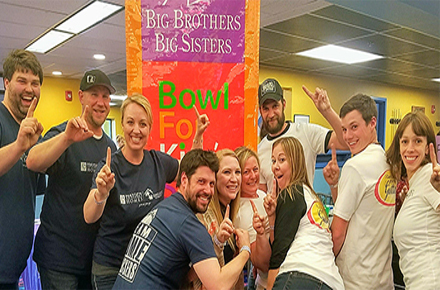 Hayden Homes had a blast at their second, Big Brothers Big Sisters (BBBS) Bowl for Kids Sake event! With two teams competing to raise money for the organization… we came in first and second, overall, raising nearly $18,000 for the charity. It’s always an honor to be able to participate in the community in this way and get not only our team members but our trade partners involved in giving. BBBS, is an amazing organization that believes that “inherent in every child is the ability to succeed and thrive in life.” They pair a child with a mentor who helps show the children what truly is possible! Thank you to the team and BBBS for all you do for the community. 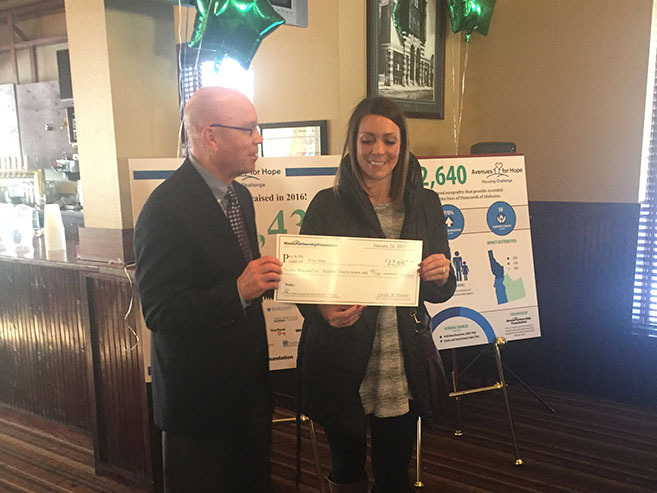 The sixth annual Avenues for Hope Housing Challenge launched, with 44 nonprofits from across the state of Idaho, in order to raise funds that will help expand programs that care for the homeless and those in need of housing assistance. Organized by Idaho Housing and Finance Association and its foundation, the Home Partnership Foundation, the 24-day campaign is designed to rally support for the 44 participating nonprofits who manage the day-to-day work of serving the more than 4,000 homeless in Idaho. First Story, and the South Idaho Hayden Homes team, participated for the first time this year and was able to raise $12,697 for the organization! 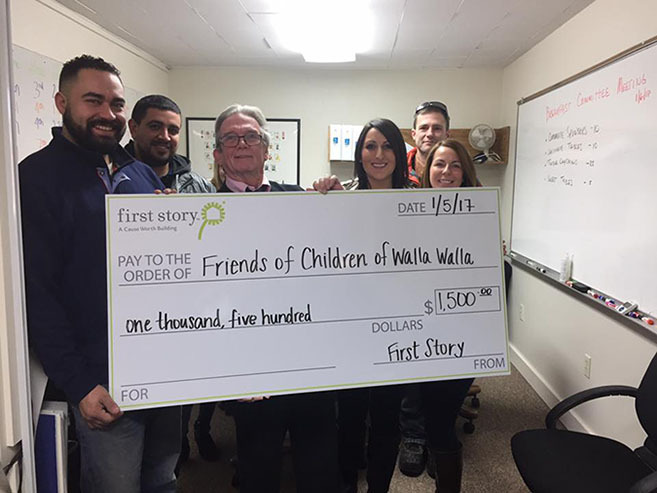 On January 5, 2017, several of our Hayden Homes team members gathered to deliver a First Story check to Friends of Children of Walla Walla – a great non-profit engaging in our youth. 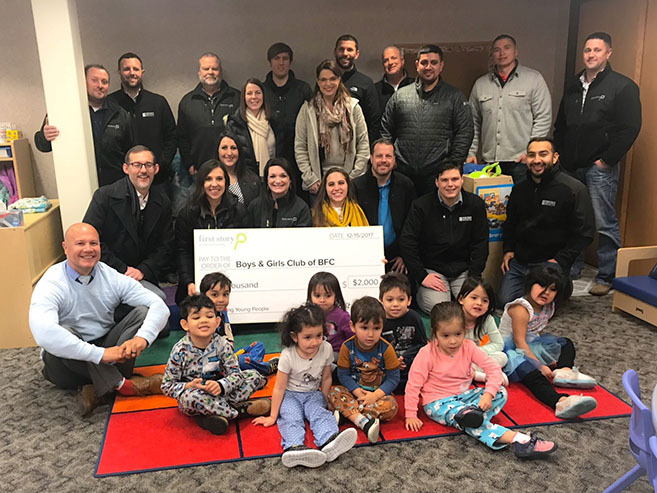 They are improving lives and communities one child at a time, and we couldn’t have been more excited to donate to such an incredible organization. It was an honor to be able to give to this organization that is dedicated to giving to the communities in which we build and helping those in need. 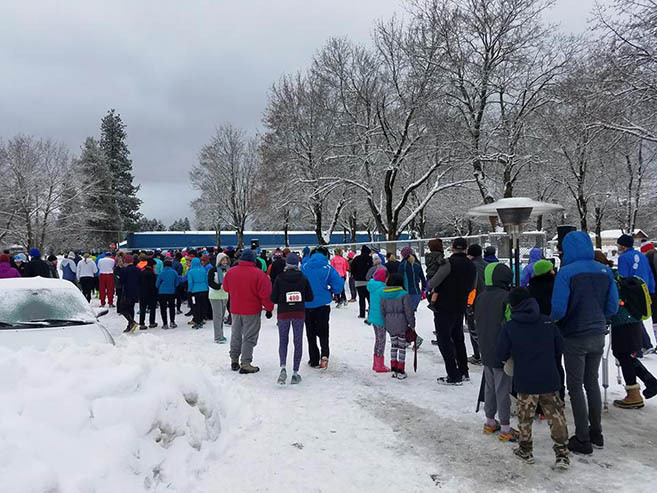 It may have been only 25 degrees and snowing, but that didn’t stop the more than 250 dedicated and hearty souls from participating in Tesh, Inc.’s 40th annual Hangover Handicap 5 Mile Fun Run. Between registrations and sponsorships, including support from Hayden Homes, Tesh raised approximately $15,000, which will help fund the Tesh mission of offering choices and opportunities to people of all ages with disabilities or other challenges seeking greater independence, self-sufficiency, and participation in the community. Hayden Homes is proud to partner with organizations like Tesh, which work to improve lives and strengthen our communities. In addition to the Hangover Handicap, Hayden Homes is also proud to be a sponsor of Tesh Fest, the organization’s annual dinner and auction fundraiser taking place this year on May 6. For more information and to find out how you can help support Tesh, visit www.teshinc.com. 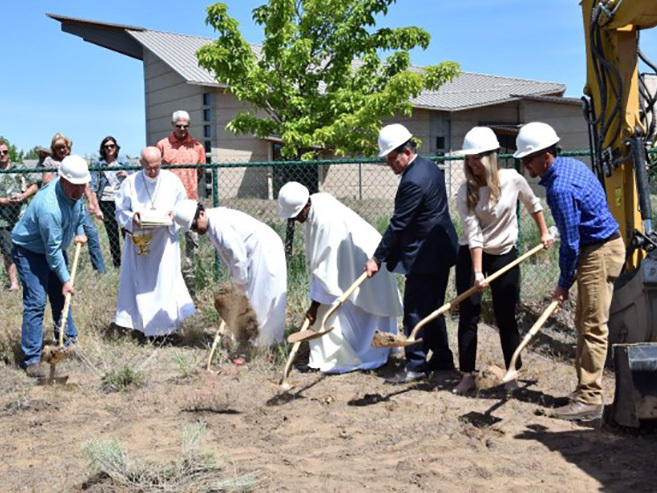 In 2016, Hayden successfully created a partnership between government, private and public entities to tackle the need for vital affordable housing in Central Oregon. The partnership, the first of its kind in the State of Oregon, created a community that will provide home ownership to 13 work-force families. These hard-working families struggle to afford quality housing due to rising rents and limited availability. The first family moved in December 2016 and more will follow in 2017. 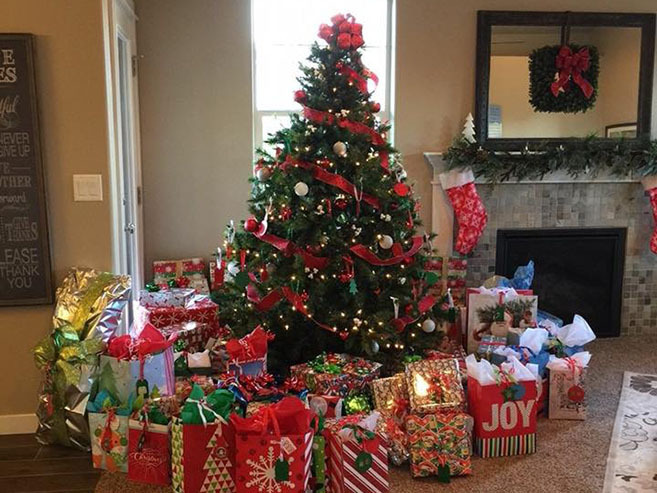 The season of giving is upon us, and we at Hayden Homes couldn’t be more excited about it! We were proud to be a sponsor of the 10th annual Books for Tots reception, held at Bardenay Restaurant in Coeur d’Alene. Books for Tots was created to collect books for underprivileged kids in North Idaho. All the books will be distributed along with the toys collected by the local chapter of Toys for Tots at Christmas time. 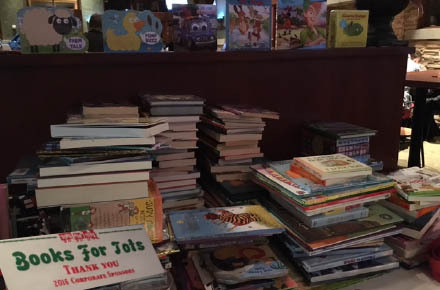 While hundreds of books were donated at the reception, several local businesses also accepted donations of new books. In the spirit of giving and of the season, many of our employees volunteer their time for organizations within our communities. The holiday season is a great time to get out there and give to your community, we hope you will join us at the holiday’s by donating to or volunteering for a worthy cause to spread some holiday cheer! Hayden Homes was happy to be able to contribute $6,600 to the City of Redmond, for an art fundraiser. Redmond Committee for Arts in Public Places Chairwoman, Linda Gilmore Hill, said the fundraising money will help add pieces to the city’s outdoor gallery. The Hayden Homes donation is specifically funding an art glass piece inside the Evergreen building, a historic school building being renovated to serve as city hall. Due to our long-standing city relationship of nearly 30 years, Hayden Homes is pleased to support the City of Redmond as they work to create a vibrant and growing community. The South Washington Team donated $5,000 to the Kennewick Police Department to their KPD (Kennewick Police Department) Community Giving fund. The Police Department is very grateful for the generous donation to help better the community and services they provide. Hayden Homes’ first Kennewick community was built in 1999. We are happy to support the ongoing efforts of the local service providers to ensure the residence are safe and secure. Hayden Homes was honored to be able to dedicate the park at the Pettigrew Place community, in Bend, Oregon to Rolando Garcia. Rolo was a dedicated father, incredible friend and an unwavering partner to those in which he worked. Rolo who passed away in December of 2015, was passionate about seeing his two sons through college. From this great loss, the community came together to not only support the family but also support this project to honor the life of Rolo. He will be truly missed by all those who had the opportunity to know him. Hayden Homes partnered with the City of Moses Lake to construct a 3.6-acre park, located at 1600 Truman Drive in Moses Lake. Hayden Homes donated and developed the land for the park, installed irrigation and a pathway, planted grass, trees and bushes. This is a twofold celebration for Hayden Homes, as we were thrilled to be part of creating a beautiful new park for the residence of Moses Lake, and we were able to show our deep appreciation to the Moses Lake community for their support of Hayden Homes since the first community was built in 1993.